If this card is sent to the GY: You can banish up to 2 other LIGHT Fairy monsters from your field and/or GY; add the same number of Level 2 or lower LIGHT Fairy monsters with different names from your.. If you activate a Counter Trap Card, OR if you negate the activation of a Spell/Trap Card, or monster effect (except during the Damage Step): You can banish 2 other Fairy monsters from your hand, fiel..
Each time a Counter Trap Card is activated, immediately after it resolves, this card gains 500 ATK and if it does and "The Sanctuary in the Sky" is on the field, add 1 Counter Trap with a different na..
You can Special Summon this card (from your hand) by Tributing 1 "Airknight Parshath". If this card attacks a Defense Position monster, inflict piercing battle damage. If this card inflicts battle dam..
Pendulum Effect: Apply these effect. :- You do not pay LP to activate Counter Trap Cards. :- You do not discard to activate Counter Trap Cards. Monster Effect: If this card is destroyed by battle or c.. If you have exactly 4 Fairy-Type monsters in your Graveyard, you can Special Summon this card (from your hand). If Summoned this way: Target 1 Fairy-Type monster in your Graveyard; add that target to .. If another Fairy monster(s) is Summoned: Inflict 600 damage to your opponent. Once per turn: You can send 1 face-up Fairy monster you control to the GY, except "Athena", then target 1 Fairy-monster in.. When this card is destroyed by battle and sent to the GY: You can Special Summon 1 LIGHT Fairy monster with 1500 or less ATK from your Deck. If "The Sanctuary in the Sky" is face-up on the field, you ..
During your Main Phase: You can return this face-up card from the field to the hand. During the Damage Step, when a LIGHT monster you control battles (Quick Effect): You can send this card from your h.. 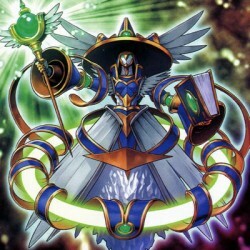 This card's name becomes "The Sanctuary in the Sky" while on the field or in the GY. Fairy monsters on the field gain 300 ATK/DEF. Set Spells/Traps cannot be targeted by, or destroyed by, card effects..